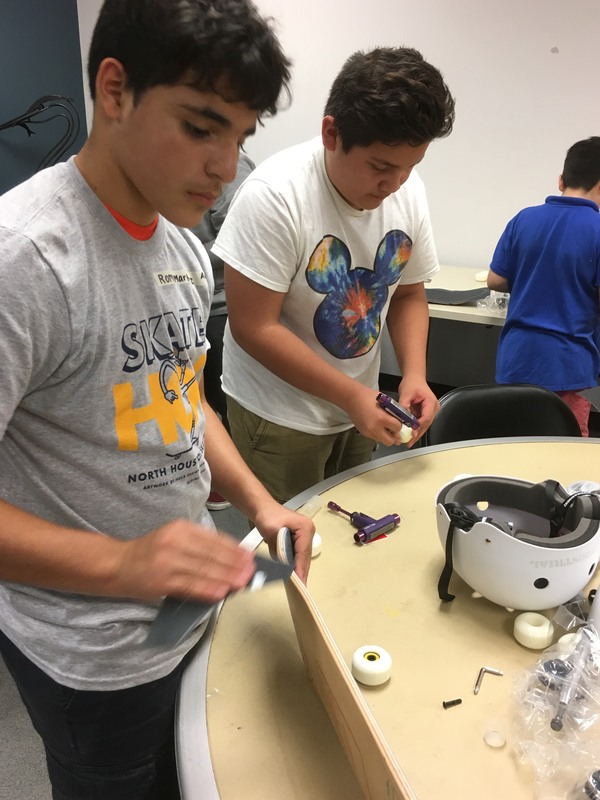 The goal: Give local kids the opportunity to learn about, design, and build their own skateboard. Introduce them to the library, the skate park and other kids in the area and to give them a safe comfortable means to exercise. The beginning: When I started in May, there was a skeletal beginning to a program by my predecessor, Ruby Robinson. She had been in touch with an organization called the Greater Greenspoint Redevelopment Authority and they offered to provide the funds for kids to be given brand new high-end skateboards, helmets, and training to use at the North Houston Skate Park which just happens to be in our part of town. The kids on a tour of the Skate Park. For many kids this was their first time seeing a skate bowl. The format: Day one, come to the library and learn about our services, meet each other, fill out paperwork, ask questions, learn about what to expect for the rest of the week. The players: Greater Greenspoint Redevelopment Authority: Sponsor, Trenna Dockery: Manager of North Houston Skate Park, John, and Michelle Mayes: Owners of Clouds and Tricks Skate Shop, ordered/delivered materials, taught building boards and skating, Myself: Youth Services Librarian at Aldine Branch Library in the Harris County Library System pulling all of the strings together. The early attempts: We ran the program twice in the summer. Both were successful in that we served the number of kids that we hoped to, ten in the first session, twelve in the second but the catch was that we weren’t serving the kids in our neighborhood. The two-pronged obstacle that we were facing was that most of our participants found out about the program from the skatepark or from the internet, but most of our patrons don’t have access to the internet at home and most couldn’t get a ride to the skatepark to participate. John Mayes working with the kids. There is a lot for new skaters to learn! Safety is a big concern and all the kids learn how to fall first. Dreaming bigger: Treena, John, Michelle and I began discussing how we could make a bigger and more successful December program. We wanted to serve more kids, serve kids in our own community and maybe even provide them with a commemorative T-shirt. Highlight: When the transportation component was secure I was able to go up to one of our regular kids (who I’ll call James) who was hanging with his friends. He had wanted to be in the program since it began but never could because he couldn’t get to the skate park. James: “No way to get there,” arms crossed, slides further down in seat. Throwing hope into the air: Thanks to a colleague I was connected with the local YMCAof Greater Houston. They were more than willing to provide transportation and extra assistance at the skate park which meant that some of the kids whose only obstacle to attending could now safely and efficiently attend the program. I also posted a public plea on Facebook to see if anyone could suggest a fairly priced T-shirt company with quality work. That is when Ann Brooks and her Black Swan Screen Printing company joined us and improved our program tenfold. Black Swan Screen Printing: Ann Brooks is a highly respected Houston businesswoman. She has been an essential figure in the art and music industries. She saw my plea and messaged me offering to meet to discuss our needs for the program and see what she could do to help us provide not only the current students but the past students with a commemorative shirt. She found an incredible designer, Huls Design and he made an original design for us. She then created a video of each shirt being hand pulled on a silkscreen in her workshop. Ann also introduced me to artist Jake Eshelman who owns the company Side Project Skateboards. Adding an art component: For the first couple of sessions, our art component of the program was incredibly simplistic. We showed some pictures of what skateboards could look like and provided the kids with pens and simple paints. For the latest session, Jake came out and talked to the kids. He told his story of what skateboards and skateboarding mean to him, how art is infused in his life and how the two can be combined. His words of warmth and knowledge made a marked improvement in the kid’s creativity and confidence. He walked around from child to child giving tips, advice, and encouragement. We all agree that this session the boards were more vibrant, cohesive and inspired. Jake loved the concept and has agreed to become a regular partner to the program. He already has more ideas of how to introduce art to the kids and has offered to supply better paints and supplies. Well thought images can make an impressive design. A unicorn in the process. A hot fog skate board. Jake helping to inspire design. The future: In this last session we were able to provide transportation to North America’s largest skateboard park, skateboards and helmets and the lessons to build them, T-shirts, art instruction, snacks every day, pizza the final day and an introduction to the library. We have plans to continue this event quarterly and would love to continue to expand and improve the event for all involved. Questions? Comments? Ideas? All are welcome.